We managed our way through all of that, however, and got ourselves up to Portland a couple weeks ago. We had gone back and forth on how to get up here, weighing our options between flying and driving. Each had plenty of cons... flying meant a lot of prep work to get things ready for the movers and also dealing with the cats flying for the first time (our eldest cat, Bigfoot, has given us some health scare in recent years so we considered flying with plenty of caution), and driving of course meant a very long drive with two emotional cats. In the end we chose to drive. It was a lovely drive with plenty of beautiful scenery along the way, but I wholeheartedly recommend not ever attempting it with two cats on board! We've taken some time and have finally sort of settled into our temporary home for the next few months, and I am trying very hard to not think about how we will have to be packing and moving all over again in about 5 months time. In the meantime, we're enjoying the surrounding area near the temporary apartment and trying to get to know more of the hidden gems throughout the city. Thanks for wise advice, Panda Express fortune cookie! During our most recent trip up to Portland we got a chance to check out the LAIKA exhibit, Animating Life, at the Portland Art Museum. LAIKA are the creative geniuses behind the amazing stop-motion animated films Coraline: A Handmade Fairy Tale, ParaNorman, The Boxtrolls, and Kubo and the Two Strings. We've been huge fans of their films for many years, so it was an incredible experience to be able to see and learn about some of the process behind their films. The exhibit was filled with many puppets, props, sets, and conception pieces from all four of their films. The sheer size of some of the set pieces was astounding, and the level of detail in everything was great to see in person. The skeleton warrior from Kubo was particularly impressive due to the puppets colossal scale, reaching nearly two-stories. If you're in Portland, I would definitely recommend taking the time to go check out the exhibit while it is at PAM, it will be on exhibit until May 20, 2018. Maybe I need a therapy dog? Anyone that knows me, knows just how much I absolutely dislike flying. I work myself up worrying about every minuscule detail about flying, from taxiing to the airport to boarding the plane to getting into the air and then back onto the ground. I can't fully describe why, but I think it mostly is just a control and trust issue. I would probably feel much more at ease if I were flying the plane, I guess, haha. This year, though, I tried my very best to become more comfortable with flying since we were flying quite often between San Jose and Portland in order to better acquaint ourselves with the area as well as to look at potential homes. On one flight last mid-October there was one passenger in particular that helped make the trip a little bit easier for me. Napping on my backpack below the seat in front of us was this service dog, who was completely calm about the flight. Every so often I'd look down and look at him and he'd look back at me, giving me a confident yet relaxed stare as if to say "take a chill pill". 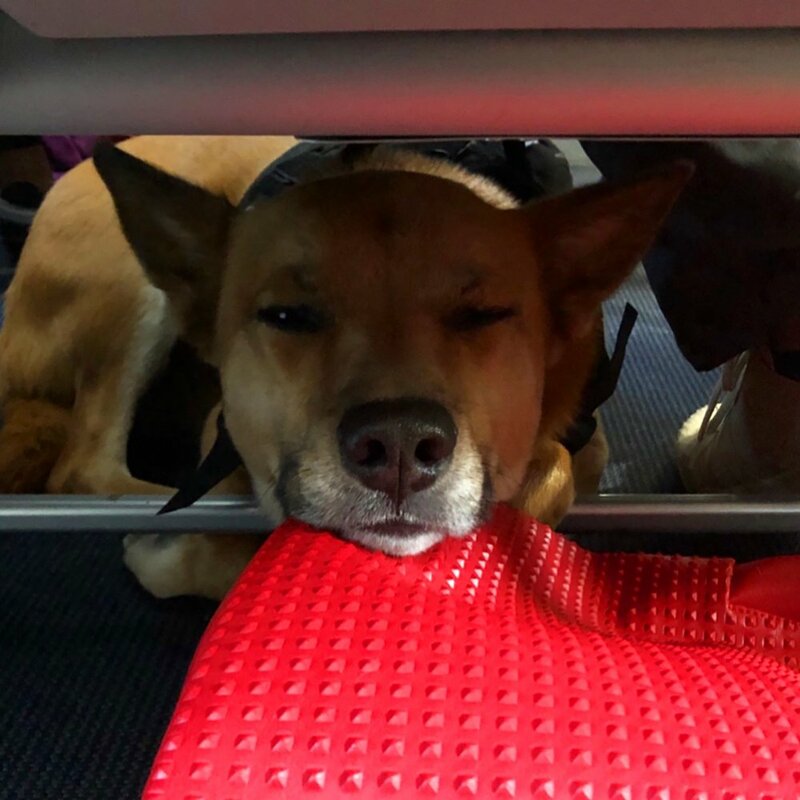 I didn't get a chance to pet him, but our visual interaction really did make the flight seem all the more shorter than it actually is (about 1.5 hours if you're curious); so for that I thank you, Mystery Dog!